Charlotte & Kaylin make the paper in New Orleans; Mona’s dips into Intrigue at home. The biggest national burlesque news this week is the upcoming New Orleans Burlesque Festival, which was founded in 2009 and gets bigger and more glamorous every year. The burlesque “wheel” taking shape among the festivals across the country is creating a solid circuit of venues and cross-pollinated communities from coast to coast and beyond. The quickly growing national network is creating more opportunities for burlesque performers to tour, as well as the elusive ability to support themselves along the way. It’s a win-win situation for performers, as well as for purveyors of burlesque and cabaret on a national level. Things just keep getting better with our self-powered, creative community. But back to the great state of Louisiana. 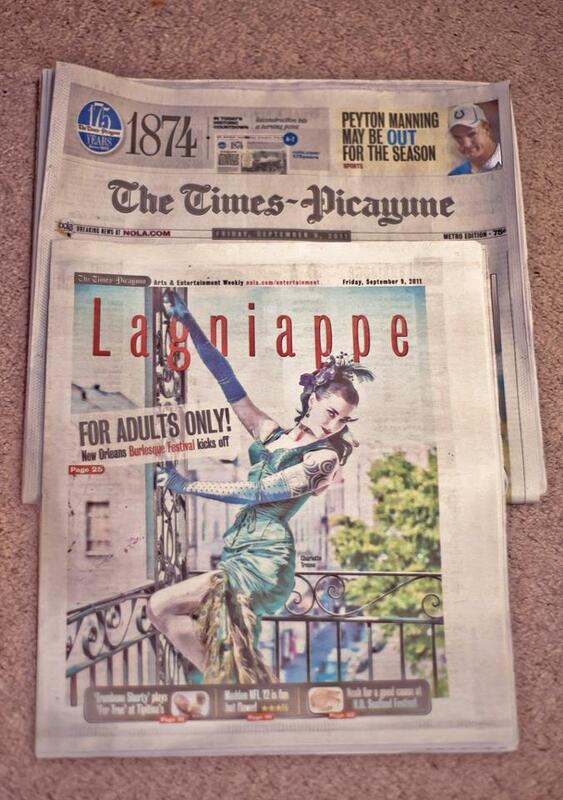 The New Orleans Burlesque Fest made the front page of The Times-Picayune’s Entertainment section this week, starring our sister city of Portland’s very own Charlotte Treuse. The photographer, Kaylin Idora, is one of the best in the business and has created beautiful portraits of everyone from Charlotte to Coco Lectric to stunning performance images of the likes of Catherine D’lish. Congrats to Charlotte Treuse & Photographer Kaylin Idora for making a beautiful front page. For more information on Kaylin’s work, click HERE, and for the beauty and bounty of the New Orleans Burlesque Festival, click HERE. Stay tuned for pix and reporting from BSP contributor Paul O’Connell (POC Photo) after the New Orleans Burlesque Festival…. Tonight in Seattle, the swanky Mona’s Bistro & Lounge dares to show a little skin with their monthly Intrigue show- this month’s dalliance is called The Scintillation of September. Burlesque Seattle Press hasn’t been over there yet to check it out, but it’s fair to say that fine dining and cocktails mixed with low lighting and fleshy parts usually pique our collective interest. Perhaps Mona’s will be the new carrier of the torch that Miss Indigo Blue began with her stint curating the former Blue Moon Cabaret at the Pampas Room (Julie Atlas Muz, Jo Weldon, Catherine D’lish, and many others performed on those high-end, but highly worthwhile shows). Intrigue @ Mona’s is an upscale night of dancing and drinking, hosted in the secluded ambiance of Mona’s Bistro & Lounge. Enjoy stiff, specialty cocktails and happy hour tapas served by Mona’s infamous bar staff, as our sultry burlesque stars enchant and amuse you. A complimentary amuse bouche will be served at intermission. After the show, the music takes over — join us as the lounge transforms into a private dance floor. ~ by angrytruffle on 09/14/2011.